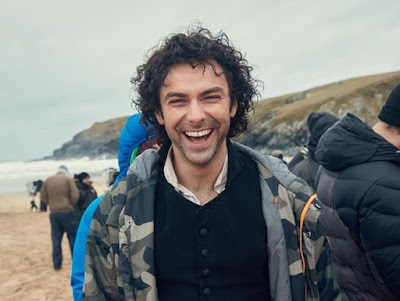 Poldark series three premieres in the US with a two hour episode on 1 October but some lucky fans can get to see the first hour days earlier at one of the preview screenings held by PBS stations. Follow the links to register. WGTE Public Media is holding a screening in Toledo on Thursday 21 September, 6.30-8pm EDT with door prizes, light refreshments and station tours. This event is free. KCTS9 in Seattle has a preview on Thursday 28 September, 6-8pm. The guest reception includes cheese and wine, swag bags, prizes and a photobooth! Tickets cost $60. NPT in Nashville has a free screening on Thursday 28 September 6-7 pm CDT and fans can pose for pics with a life-size cut-out of Ross! KPTS Channel 8 are holding a free Poldark S3 screening and Happy Hour event, showing the first hour of series three, on 28 September, 5.30 to 7.30 pm CDT at the Wichita Scottish Rite Centre, Wichita. They say on their facebook page that there is no need to book as they can seat 200 people, but you may like to verify this. Who doesn't love the costumes in a period drama? 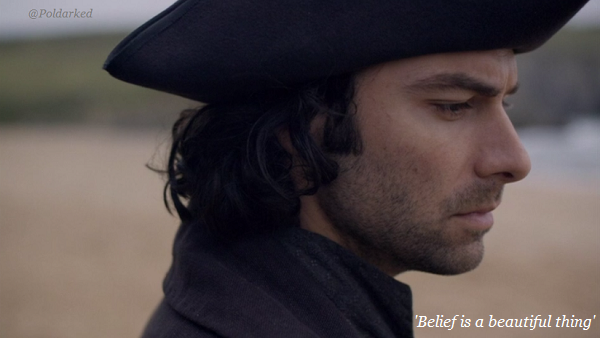 I know I do, so I just couldn't resist a visit to the Dressing the Women from Poldark exhibition at Nuneaton Museum and Art Gallery. 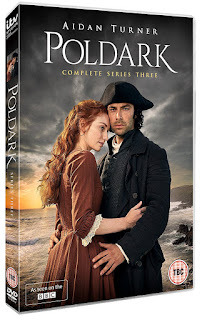 The exhibition consists of nine outfits worn by Demelza, Elizabeth, Verity and Caroline in Poldark series two, with the exception of one of Demelza's dresses from series one. 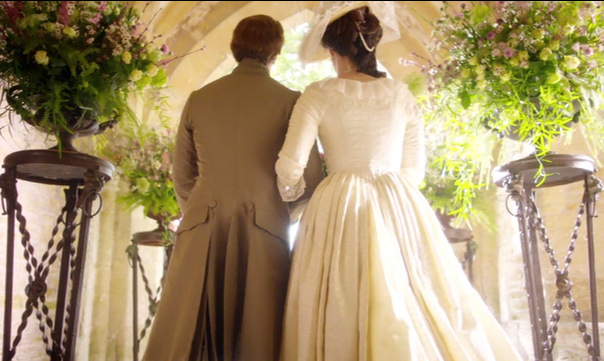 There's Elizabeth's wedding dress from her marriage to George Warleggan and Caroline's red riding outfit, but the dress which caught my attention most was Demelza's ball gown from Hugh Bodrugan's ball. Had the seawater stains come out from her walk along the shore in it? Handily, the museum supplies magnifiers so I was able to inspect it very closely and amazingly, yes, it seems they have! I could see no sign of salt water stains. There was a tiny white mark about a foot from the hem at the front of the dress, but whether that was mark from the sea water, I can't say. The dresses are all given plenty of display space: many you can see from the side as well as front and, wonderfully, very close up. Understandably, you cannot touch them or take photos. 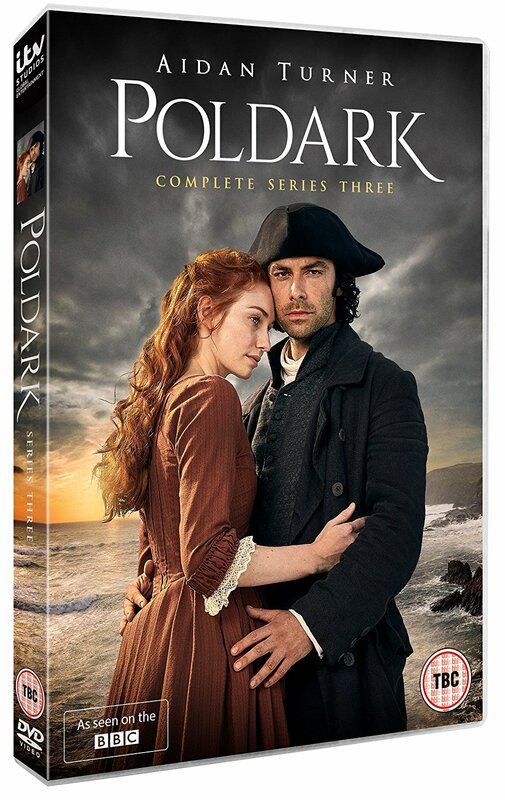 Each outfit has a bit of information about the character, the fabrics, the scene it was worn in and the designer, which I particularly liked as there were two designers on series two (Susannah Buxton and Ros Little) and I had long wondered who had designed which costume. 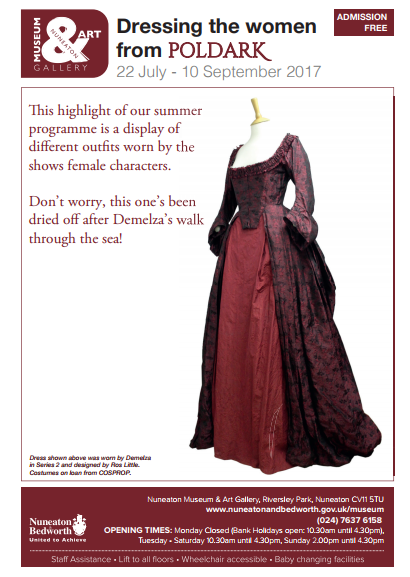 Dressing the Women from Poldark is at Nuneaton Museum and Art Gallery until 10 September, 2017. Entrance to the museum and the exhibition is free. There is car parking close by and the museum is about a ten minute walk from the railway station. Demelza's luxurious red and black floral ball gown from Poldark series two. Elizabeth's wedding outfit from her marriage to George. The dress worn by Caroline when she visits Dwight the night before he leaves for the Navy. 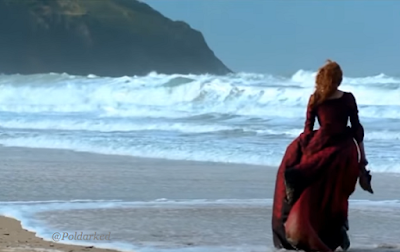 The yellow striped dress which was one of Demelza's main outfits in Poldark series one. 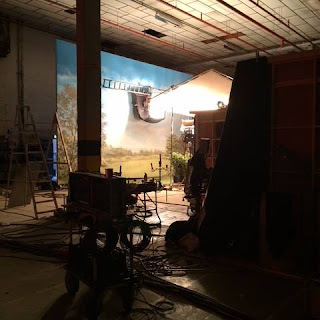 Caroline's riding suit which she wears when Dwight thanks her for the oranges for the villagers. Dressing the Women from Poldark is specially put together by the costumers Cosprop for Nuneaton Museum and Art Gallery and, sadly, is not a touring exhibition.